Next class will be January – March, 2019 at the WSU Thurston County Extension Office. Contact Stephen Bramwell for more information. 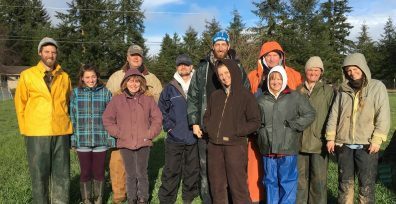 This quarter-long class will provide practical information about whole farm planning, ecologically-based, diversified production systems, and alternative marketing techniques. Gain knowledge of the practical aspects of sustainable small acreage production systems for a wide variety of enterprises. The course involves guest lectures from local farmers, field trips, as well as classroom instruction. Students will develop a whole-farm plan during the class. The 2017 Whole Farm Planning class on a field trip to Kirsop Farm to learn about pastured poultry, raising sheep and growing grain for feed. Thanks Wendy Clark for the great field walk!